UK - Lighting designer Tom Campbell has chosen to use an Avolites Sapphire Touch to programme and control his nightclub-vibe lighting design for Dubstep/garage star Katy B's UK tour. Campbell, who has designed a budget defying creative floor package, which comprises Philips Showline NITRO 510Cs, Clay Paky STORMY CCs, Clay Paky B-EYE K10 and K20s, along with a number of 14w OPSL Lasers, delivers a fast-paced, beat-precise show that has had audiences jumping throughout the tour. "I'm a big Avolites fan, they're great consoles, really easy to use and fast to programme," says Campbell. "They come with all the features I need and I always spec them. I also own two myself - the Tiger Touch and the Titan Mobile." For Katy B Campbell is using the Sapphire Touch backed up by his own personal Tiger Touch. "I'm using the Sapphire for this because it allows me to speedily program multifaceted, multi-layered effects, including some complex pixel mapped looks using the Clay Paky B-EYEs," explains Campbell. Indeed the Sapphire Touch has 45, smooth running, motorised master faders and two large, super responsive and easy to read touch screens. This makes it easy for Campbell to work on the fly and to blend his floor package with the various receiving venues in-house rigs: "I keep the set list and followspot notes on one screen as a handy reminder, and I have the stage view on the other. The console enables me to lay my show out logically so I can interact with it manually without having to refer elsewhere for information. The best thing about all the Avolites consoles is that they make it easy to deliver a complex looking show, whilst at the same time allowing that all important hands-on feel." What Campbell particularly likes about the consoles that he actually owns is that they're totally portable. "I can fit a laptop, a Titan Mobile and an 11" touch screen in my backpack. This can be invaluable when I am travelling," he points out. "I can take it on a plane as hand luggage and turn up anywhere in the world with a console that I'm familiar with and has my show loaded up - I love that." 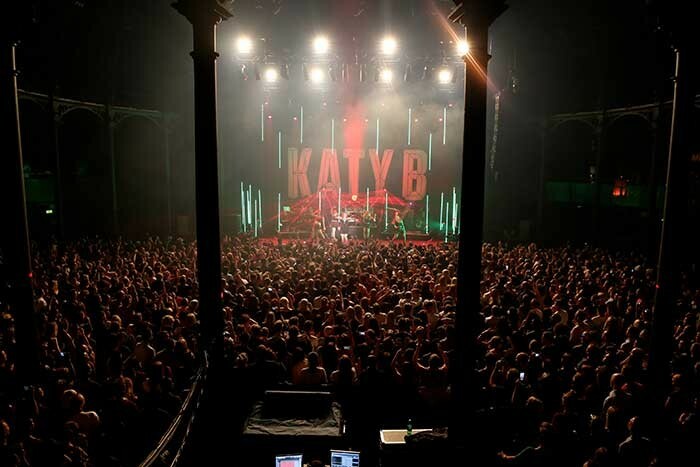 Katy B toured through October at venues including London's Roundhouse, Manchester Academy, and the O2 Academy Newcastle.